There is a mate to this one, on the other side of our kitchen bump-out (which I realize badly needs a scrape, sand, prime and paint itself) that was also fugly. I had to use a wire brush on the really bad rust spots. It does a great job of getting all the tough rust off the metal. My rule of thumb, keep brushing until there isn't anything flying off into your eyeballs. And of course, never wear goggles. Now everything is much smoother! Next up, my most favorite product for priming any item around our house...'rusty metal' primer that is ironically, the color of rust. It goes on so quickly and dries in no time. I love it so much! 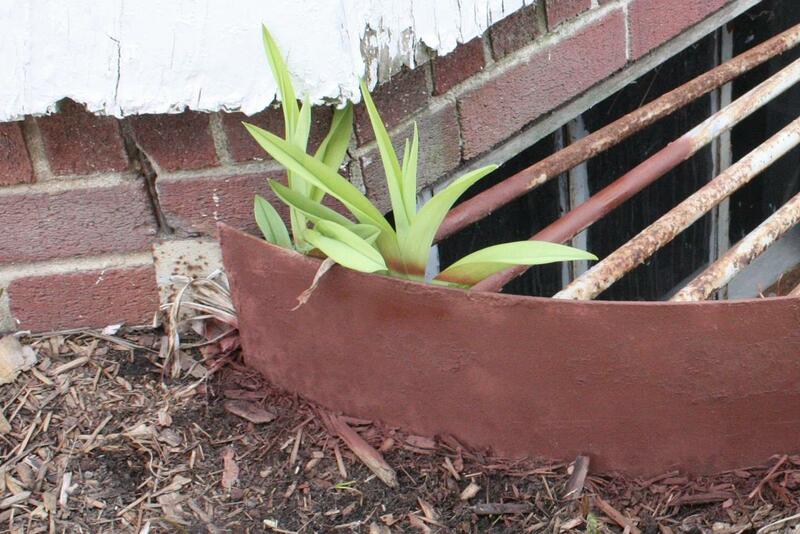 Yes, some lilies (and mulch) were painted in the process. It's their fault for growing too close and inside the stupid frame. And the finale, Glidden Sweet Tea. This is the exterior flat latex paint I have used all over the outside of the house. I love this color with our brick. Not bad, if I do say so myself. Although, it only makes the peeling white paint look even worse. The wells are looking pretty, but in just a short while they will be completely covered with the daylilies. I can't say I'll complain about all my hard work being covered by those beauties! Now I just have to take care of that rotted siding. Bah. Love that primer!! And, our daylilies are coming up nicely too. It looks great and I can only imagine how beautiful those lilies are going to look once their bloomed! I feel like this is a really random project but probably makes a WORLD of difference. Good for you for tackling it! Don't you love how one project leads to another and another and another? Your lilies and other flowers look beautiful! I'm jealous! I need to work on our own landscaping. So much better! And serves those darn lilies right for growing too close! We have a lot of things we need to work on around our house, but all I want to do is work on the backyard. Oh well, who needs curb appeal anyhow? Thanks for this post - I have been curious if that Rusty Metal Primer worked. I have a old iron stove that needs a coat or two. Love your home! You have done so much to make it your own and it is beautiful. Thanks for the tips on painting window wells. Ours are pretty gross and we may have to try that. Sometimes little things make all the difference! Enjoy! All I can think of is that the window well looks like a huge bump-it for a 10 foot tall Snooki. What a huge difference a little spray paint makes! You home has great curb appeal. Wow, it's looking great out there! We were given some daylilies by our neighbor a couple of years ago, and now I know why - they multiply like crazy! They are pretty, though. And pretty much the only thing I can keep alive. Didn't you have like 82 feet of snow just last week? How has everything bloomed so quickly?!?! It's awesome...and yay for a fresh coat of paint! hey looks like you could use some tuck pointing around the bricks by those window wells no?